I have a new Toyota Prius (2017 model), bought between 12-13 months ago. The car recently has gone totally mad (Ironically 1 week after the service). So I arranged a booking to get it checked out, but the car won’t start. On top of that, the car dealer isn’t close and the appointment is in a 2-hour time slot, and every time needs to be rearranged. When I called them they said I should ask my insurance to bring the car to them. My insurance doesn’t have roadside assistance, and to bring the car to them I need to subscribe a new one (Toyota roadside assistance). I have no idea what should I do and how to avoid paying a non-refundable third party to bring the car there. Update 1: The car died definitely after the video, now doesn't blink, it doesn't turn on at all, the electronic lock on the doors don't work anymore (I had to close the doors from inside manually and then use the hidden key). Update 2: I call the dealer multiple times, was very hard but at the end, they reply to my questions about the warranty. I insisted on that because the warranty manual says: "The warranty covers the cost of towing your vehicle to the nearest authorised Toyota repairer in the event of breakdown immobilizing your vehicle, if that breakdown is the result of a warrantable defect." When I call the Toyota UK mainline, they said that the local car dealer has to tow my car, however, when I speak with the car dealer they said AA has to tow the car even after I read them the warranty, that they signed on the first page. At the end, I didn’t have any other choice that subscribes a roadside assistance with AA on behalf of Toyota since Toyota roadside assistance is AA. Update 3: today (12/12), I call Toyota roadside assistance, at the beginning they didn't found my cover, after passing them the code they sent in the email they verified I'm covered and they redirected the call to AA. AA sent a technician to check the car in my driveway, the idea was that they fix the car enough to make it drivable tomorrow morning so I can bring to the dealer. Unfortunately the battery is fully dead (it has 3V of output), and the battery didn't charge at all. So I had to come back from the office because the car couldn't be turn off (if you turn itoff you can't turn it on again, and my girlfriend can't drive), I drove the car to the dealer, once I parked the car in front of the garage, I turn it off, when I tried to turn it on again to check, didn't turn on (the car was on for around 1h and 30 minutes). Tomorrow morning a mechanic will check the car, and hopefully they will fix it free of charge. Total cost up to now: 84£ for Toyota roadside insurance (1 year). within the legal guarantee period of two years, defective products must be repaired or replaced without any cost to the consumer. This includes shipping costs. This means that you will not bear the costs of the towing. If the dealer does not want to tow for you, you will be able to charge back. The garage probably hasn't understood from your description that the car isn't driveable. Contact them again and tell them the car is under warranty, it is not driveable, and you want it fixed or want a replacement car. If they still refuse to come and get it, then tell them you will get a third party to tow it to them and charge them for the towing costs. If you get no joy from the dealership at that point I would go directly to Toyota. 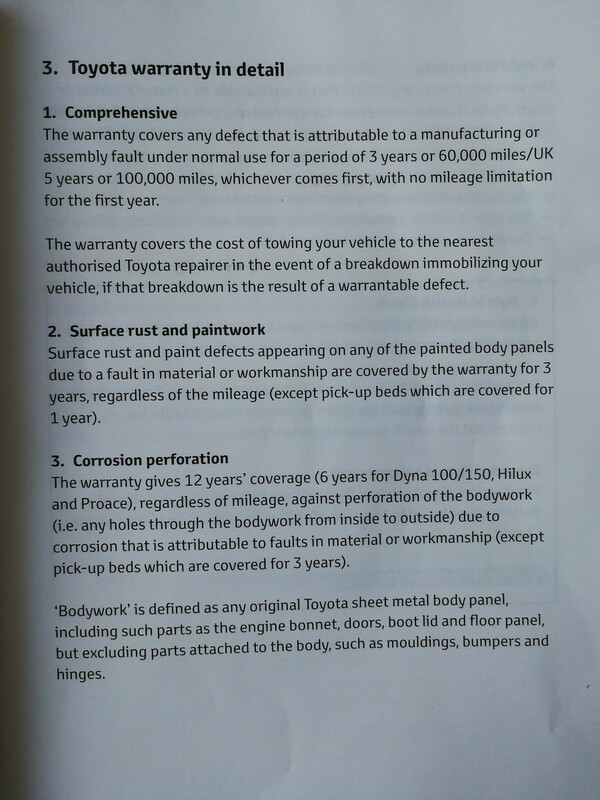 The key part of your warranty is "[...] if that breakdown is the result of a warrantable defect". Your video clearly shows a message on the information display which says that the 12V battery is low. Further, the symptoms described in your question are entirely consistent with having a discharged 12V battery. This issue is clearly not caused by a warrantable defect. Therefore, the dealer will not pay to have your car towed to his location. You should locate a set of jumper cables and a friend who will help you jump your car. Note that hybrids often have a slightly different jumping procedure compared to non-hybrids, so you should read the manual before attempting to jump it. Your warranty says towing is covered, and assuming the warranty conditions are met (e.g. mileage and vehicle age) you can insist. Contact Toyota UK - the dealer may be independently owned and operated, so Toyota UK may have some clout over them. Escalate to a supervisor and explain that the dealer is not honouring the warranty. Contact another Toyota dealer - although you bought the vehicle from them, the warranty should cover it whichever Toyota dealer handles the issue. If you paid for any part of your vehicle with your credit card (e.g. a deposit) and the cost of the towing is less than that amount, you can open a 'dispute' with the credit card company for the amount of the towing against that deposit amount. If you ultimately end up paying out of pocket, you can later go to small claims court to get your money back - no solicitor is required, you can represent yourself. If you really want to speed things up, engage a solicitor or barrister, but you may not necessarily get back the (probably >£500) cost of the solicitor or barrister, but you should see a sea change in their treatment towards you. You need to keep their costs in perspective however. Citizens Advice may also be able to help you with other options (there may be a local ombusdman for car dealers, etc. that would help your situation etc.) before you go to small claims court etc.. Car manufacturers usually provide free breakdown assistance during the warranty period. Toyota's website does mention this option (https://www.toyota.co.uk/contact-us) although it does not detail if all new car owners are automatically enrolled as members. Check your warranty details or just contact them directly. If you're covered, they should take care of towing your car to the dealer. Even if not, they should explain how this is covered and reimbursed under warranty. At the root this problem is one of the local dealer not wanting to provide a service which the parent company says must be provided. In situations like this I've received the best success through calling the parent company, explaining the situation and confirming your understanding of it then asking them to conference in the local company into the call. When you do this you add weight to your claim that the local office is misconstruing the agreement. There are now lithium-ion based batteries for jump starting. The reality is that lead-acid batteries are failure prone, having a battery pack that you can carry in the car that can jump start it is a useful thing to have. No need for anybody's help, just clip it on and start your car. They are little things, in the range of the larger USB power banks (and many can be used as such), but have the oomph to start a car a few times before being drained. Mine has seen use half a dozen times by now. Not the answer you're looking for? Browse other questions tagged united-kingdom car insurance or ask your own question.